« Do you like the new design? A while ago on LinkedIn someone asked a question about why many career coaches persist in using the Myers-Briggs Type Indicator (MBTI) when it seems to be lacking in validity as a testing tool. A number of other contributors joined in the criticism, describing MBTI as being on a par with horoscopes as well as attacking its Jungian origins and amateur-led development. I threw a few comments into the debate to defend MBTI, mainly because I like being a devil’s advocate rather than because I’m a wholehearted believer in the instrument. Even though I am a qualified practitioner and have used it fairly extensively, I do have a number of doubts and criticisms about the MBTI and Carl Jung’s theory of psychological types on which it is based. In this post I would like to talk about some of those reservations and ask some questions about what MBTI is all about. In the next post I will attempt to look at how, despite these reservations, some of the concepts of MBTI can be useful in helping people with career decisions that goes beyond an unconvincing matching of personality types to particular occupations. For those readers who are not familiar with MBTI concepts and terminology, you might want to do a quick bit of background reading first. If you didn’t do the background reading then you need to know the following bits of information to have any chance of understanding what I’m going to talk about next. Each of these functions could be introverted (focused inwards) or extraverted (focused outwards). This is their attitude. Many of the objections to MBTI from psychologists centre on arguments about statistical reliability and validity. Whilst this is a serious issue if you are going to use MBTI (unwisely) as part of a test-and-tell strategy for working with clients, frankly, those problems don’t concern me right now for the purposes of this blog post. 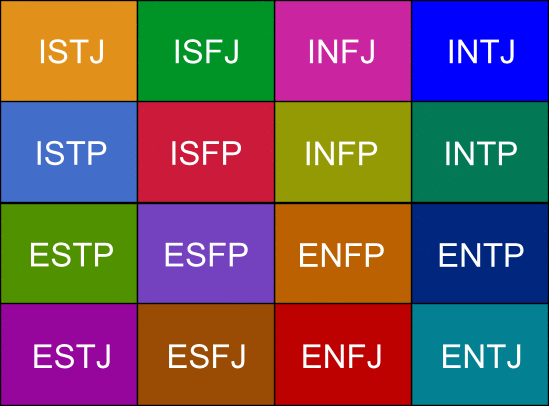 The theory behind MBTI attempts to answer the question ‘How might differences in personality arise from basic cognitive functions?’ In this case, Jung’s theory is the most important feature of MBTI (from the perspective of this blog anyway). In traditional MBTI thinking, although you use all four of the paired functions (Sensing-Intuition and Thinking-Feeling), you are born with (or develop somehow) a preference for one from each pair. So, for example, you might be consistently more likely to use Intuition (N) than Sensing (S) to perceive things and Feeling (F) rather than Thinking (T) to judge things. However, some psychologists claim that, if this either/or preference was the case, the distribution of preference scores on the S-N and T-F scales of the MBTI questionnaire would show a bimodal distribution (i.e. it would have two peaks with a dip in the middle). Instead it shows a fairly standard normal distribution, with most people scoring somewhere near the middle. According to MBTI ortodoxy this is explained by saying that people are often unaware of their natural preference, but a simpler explanation might be that lots of people do use both almost equally. When talking about extraversion and introversion, Jung himself was quite happy to admit that there are people who are not strongly one or the other. Why couldn’t that be true for the other dimensions as well? But, I have an even bigger question. Jung’s original theory of psychological types assumes that the functions in each pair are mutally exclusive opposites. So, Sensing is the opposite of Intuition. The more you are drawn to using Sensing the less able you are to use Intuition. Through this idea of opposites Jung developed the idea of dominant and inferior functions. If you put most of your energy into Thinking (dominant) then your least developed function would be Feeling (inferior), etc. It’s certainly true that when some neural pathways in the brain are activated they inhibit (or shut down) other pathways to avoid competition. This stops the brain getting overloaded. For example, when you are concentrating on an activity, the bits of your brain responsible for concentrating actually put a muffler on signals from other sensory input so that you don’t get distracted so easily (see the post on Flow). However, there are also quite a lot of functions that are quite happy to work in parallel, interact and reinforce each other. See Houghton & Tipper (1996) and Poldrack & Packard (2003), if you don’t mind a bit of neuroscience. It may be that Jung only noticed these behaviours because he was observing people who were ‘unbalanced’. It would be very easy to pick up on someone primarily driven by their Feeling function if their Thinking function was under-developed. However, it’s a bit of a logical overstep to then say that whenever the Feeling function is dominant, the Thinking function is therefore the least developed. What if Jung’s functions are not opposite but complementary? From an evolutionary psychology point of view it is very likely that various perception and decision making functions have evolved to deal with the different situations we might have to face. If accuracy and repeatability is more important than speed, then attention to detail (S) and detached analytical decision making (T) will be advantageous. On the other hand, if speed is important, then the ability to spot patterns quickly (N), to make assumptions and rapidly assess personal impact (F) will give us the edge. There will also be situations where a mix of these functions working alongside each other could be useful. If we call upon these functions to deal with varying external (and possibly internal) situations, then the aspects of behaviour that they describe are likely to be context dependent. Rather than describing aspects of personality that are reasonably constant over different circumstances (habitual traits), perhaps they should be used to look at how behaviour changes in different situations. It may be even more complicated than that. In a very early post I talked about the theory that what we think of as one whole personality may be made up of a number of distinct mini-personalities. Each personality might be linked to a different set of circumstances, memories and behaviours. Let me push this a little bit further. I might even be brave enough to suggest that Jungian typology and MBTI are actually only indirectly linked to personality. When Jung was trying to find a way of classifying and explaining different personality types that he observed, perhaps what he created instead was a simple model of basic cognitive function. In the same way that the simple model of atomic structure developed by Neils Bohr can explain some (but not all) of the observable properties and behaviours of atoms and chemical elements. The Jungian model of cognitive function can explain some (but not all) of the observable characteristics and patterns of behaviour in humans. This is what leads me to include it in a blog on career theory. If Jungian functions are really a simple model of how we observe, filter, recall and act within the world, it could be really useful for looking at how people make career decisions and how their decision making could be improved. McCrae, R.R. & Costa, P.T., Jr (1989) Reinterpreting the Myers-Briggs Type Indicator from the perspective of the Five-Factor Model of personality. Journal of Personality, 57(1), 17-40. Houghton, G. & Tipper, S.P. (1996) Inhibitory mechanisms of neural and cognitive control: applications to selective attention and sequential action. Brain and Cognition, 30(1), 20-43. DOI: 10.1006/brcg.1996.0003. Poldrack, R.A. & Packard, M.G. (2003) Competition among multiple memory systems: converging evidence from animal and human brain studies. Neuropsychologia, 41(3), 245-251. DOI: 10.1016/S0028-3932(02)00157-4. This entry was posted on 27 April 2010, 10:02 and is filed under Decision making, Models, Understanding clients. You can follow any responses to this entry through RSS 2.0. You can leave a response, or trackback from your own site. You have no clue about stats, i guess. I’m always ready to admit I’m wrong and willing to learn. P.S. I edited the passage you quoted to make myself a little clearer. Please can you also enlighten me? I thought I had some idea of stats but I can’t see anything wrong with David’s quote. I’m heartened to see you make the distinction between the MBTI and Jung’s theory — many still erroneously believe the MBTI *is* the theory. As Isabel Briggs Meyers said, “The purpose of the Myers-Briggs Type Indicator is to make the theory of psychological types described by C. G. Jung understandable and useful in people’s lives.” i have a lot to say about the usefulness of the MBTI — let me summarize by saying that I’ve been using it professionally for over 16 years, primarily as a tool for team-building in the software development industry. Over the last decade, however, I find myself using the MBTI less and less, relying instead on identifying Jung’s cognitive processes through other means. I’m inclined to agree that the MBTI itself has quite a few limitations. It can be a good starting point but it often seems to obscure more than it reveals, especially in relation to the difference between extraverted and introverted functions. I guess I’m also questioning some of Jung’s fundamental assumptions about how the functions relate to each other. I think that CJ was pretty astute to be able to put together his observations into a coherent theory like this, but perhaps it’s time to re-evaluate some of his propositions about how cognitive functions interact in the light of evidence from neuroscience. Maybe even to amend the definitions and descriptions a little. Interesting post, and a useful suggestion as to why MBTI might be useful despite its lack of scientific validity. I suspect the real reason it took off may be more due to ‘VHS vs Betamax’ factors – ie., it was better marketed and is easier to deploy than the alternatives available at the time, and now has a dominant market position. Let’s be precise about this. The MBTI doesn’t ‘lack scientific validity’ it’s just that it doesn’t measure up nearly as well as some of the other instruments around when examined using statistical methods. There’s a serious question about whether those tests are actually appropriate for assessing something based on Jung’s theories. For example, the theory expects people’s preferences and their awareness of their preferences to develop (individuation) and change with context. So a poor test-retest reliability is hardly surprising and tells us nothing useful. Having said that, I have big doubts about whether what the MBTI measures actually relates properly to the underlying Jungian functions. And I have reservations about some of the functional dynamics expressed by Jung. Hence this post. I’d love to hear about any other cognitive models you happen to have lying around – please share. Hold fire on whether you think an adapted Jungian cognitive model is any good or not until the next post. Not quite a ‘placebo’, maybe more of a non-optimally formulated and incorrectly marketed drug. ‘Vested commercial interests’ – I’ll back your wariness all the way on that one. You compare Bohr’s model of the atom to MBTI. Bohr’s model isn’t perfect and the science behind it has been shown to be obsolete – so theoretically, nobody should use it. However the Bohr model is still taught in schools. This is because the model replacing it is just too complicated. They use Bohr’s model to simplify things and hopefully explain things easily. As soon as there are more complex issues to resolve, they accept the limitations of the model, change their approach, and then move to the valence shell model (which by the way, still is not perfect). You may want to get rid of MBTI and replace it with a more statistically valid measure. However, to make one which is more statistically validated, it would have to become much more complicated (peoples’ behaviour and personality are not simple). This would probably make it much less usable with clients. And let’s face it, many of our clients WANT things to be simplified. They like categorisation because it is safe and doesn’t leave them with 4000 choices, which they then can’t cope with. However, it is necessary to accept the limitations that it has, recognise when it doesn’t suit the needs of our client and move to using different methods when appropriate. Very well written and thought provoking posts, thank you! Personally, I don’t think it’s the MBTI itself that is is the underlying issue with its misuses, it is the trait model we overlay it on top of. It is I tihnk very useful to characterize the different ways people respond to the same information and the same situation. People do approach or avoid uncertainty, closure, contact with other people, etc., and these biases do help us understand our differences as a starting point. It’s rare though to find these tools not becoming talent detectors or fortune tellers in spite of our best efforts. The more we turn them into predictions of thinking and behavior in diverse situations and at future points the more we rely on assumed stabilities of individual development and enviroment that are often there, but significantly often not. Two general principles here: the use of statistical measures to apply to individuals and the question of the canalization of developmental trajectories. That is, there are plenty of environmental conditions where the stable average measurement applies to most of the people, that’s why we use averages. But there are more people than we’d like to admit who drown somewhere in a lake with an average depth of 6″. Both statistics and the trait model have powerful uses, and they both lead quickly to misuse as well. As much as I can tell, Carl Jung’s definitions of cognitive processes may be way off if not completely wrong. If that was the case, then explaining the way people use their cognitive functions through the model of Jungian processes T, F, N and S is like Thomson’s atomic model where the atom is a uniform sphere of positive charge with electrons (raisins) embedded in it. Which is just.. way off. The reality behind it might be drastically different and probably only extensive neurological mapping can discover the truth, am I right? Or is there any proof that there are really such cognitive functions even very remotely similar to Carl Jung’s theory? Thanks for your contribution. You might want to have a look at the second post in this series. (https://careersintheory.wordpress.com/2010/05/05/do-i-still-like-mbti-part-2/) Here I try to relate Jung’s processes to cognitive functioning and refer to recent understanding from neuroscience (with a few references). I think there’s some evidence that Jung was partly right on quite a few things, but, of course, his model is overly simplistic compared with reality. But that’s what models do – they try to simplify something complex so that we can have a basis for understanding. I’m not sure a complete neurological mapping will ever truly reveal the whole truth. It would be nice to think that we could identify and isolate the particular bits of the brain responsible for different aspects of human behaviour and cognition, but it’s not proving to be that simple. The brain operates in a more interconnected, holistic and complex way that we would like. I have found the Keirsey and Jungian systems a very useful (=essential) tool in understanding other people, understanding books, films and modern poetry, and for career choices. The latter belatedly. I have found the Millon tool much less useful than the Jungian systems, but useful all the same, especially when faced by difficult (called psychotic) individuals. Neither system is scientific, especially not the Millon.